Please note: some policies may vary depending on your room, special offers and other conditions. Please check information at time of booking. We operate a non-smoking policy throughout. This means that you may not smoke in any public area or in your bedroom. Anyone suspected of smoking in their bedroom will be subject to a deodorisation charge of £100 and may be asked to leave immediately. All reservations must be secured with a valid credit or debit card. For internet bookings and special offers, advance payment is required. Reservations are not confirmed until you have received confirmation from us by email, letter or telephone. Reservations can only be accepted from those aged 18 years or older. We accept most major credit cards, debit cards, bank transfer and cash. Sorry, no cheques. You may check in from 2.00pm until 8.00pm. Later check-in by prior arrangement. Check-in after 10.00pm is not possible. Please advise us in advance of your arrival time if after 6.00pm. Check out is 11.00am. After this time your room key will no longer work. If you require late check out, please let us know. There may be a charge for this. Pets are very welcome. There is no charge for one pet per room. Please let us know your pet’s special requirements in advance and we’ll do our utmost to make his or her stay an enjoyable one. Children 12 years old and over are charged at the same rate as adults. We do not accept children under the age of 12. 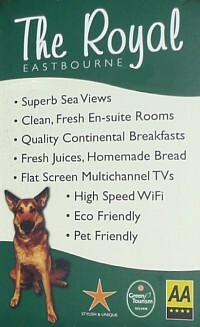 High speed WiFi internet is available in all areas and guest bedrooms free of charge. We reserve the right to ask for a (fully refundable) deposit on equipment. On street Pay and Display parking is available on the seafront and surrounding side streets. 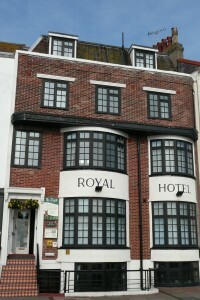 The Royal provides guests with discounted parking vouchers for permits bays. Please advise us of any special requirements or requests – from a morning newspaper to a theatre trip – we’ll be happy to help. We welcome everyone and are committed to providing an excellent quality of service to all our guests and visitors. We have an active inclusion policy for guests with disabilities and are constantly striving to improve our facilities. Currently we are in the process of adding facilities for visually impaired people. Unfortunately due to its age and structure, our property does not have a lift and is therefore unsuitable for wheelchair users and those who have difficulty with stairs.